Camp Barkeley, Texas is activated today. Italian/Greek Campaign: The new Greek Epirus Army (I and II Corps) fights hard in the Klisura Pass area on 15 February 1941. However, the front has stabilized everywhere despite both sides desperately trying to push the enemy back. East African Campaign: The British remain stuck before Keren, Eritrea. However, they continue advancing slowly in other areas in East Africa. Convoy WS 5B (a Winston Special troop convoy) departs from Durban. It has nine troopships. European Air Operations: RAF Bomber Command sends 35 bombers against oil installations at Hamburg. For various reasons, only 26 appear over the target. It also sends 43 aircraft to bomb Boulogne. Other bombers mount a propaganda mission to Poland, dropping leaflets over Cracow and Katowice. Coastal Command bombs the docks at Calais, and the RAF mounts Rhubarb raids during the day. The Luftwaffe attacks the Northumberland mining district. About 130 bombers appear over the coastal area. While it is not a major raid by London standards (which also receives some attention today), it is large by local standards and causes numerous casualties. The Luftwaffe loses a Heinkel He 111P from 6./KG 4 (5J+GP) which crashes at South Shields. There are several deaths, and a land mine that the Heinkel was carrying explodes and causes devastation. The Marguerite, lost today in a collision with the Robert. Battle of the Atlantic: German battlecruisers Scharnhorst and Gneisenau continue refuelling from tankers Esso Hamburg and Schlettstadt. Admiral Lütjens is contemplating his next move south toward the shipping lanes. German heavy cruiser Admiral Hipper makes port at Brest (some sources say 14 February). It has sunk 8 ships of 34,042 tons. The Royal Navy is aware of its presence and sends out four destroyers from Plymouth to stop it, but they get there too late. The ship also attracts unwanted RAF attention. German authorities immediately begin considering whether to send the ship back to Germany. German raider Pinguin, operating in the mid-Atlantic north of the island of Tristan da Cunha, meets with tanker Nordmark. Pinguin still has several captured Norwegian whalers which need prize crews. 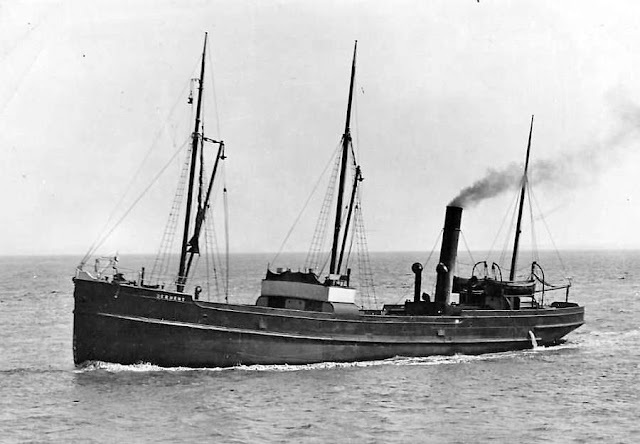 Nordmark itself has the captured "floating delicatessen" refrigerated ship Duquesa, renamed as Herzogin. The ships hook up for several days. U-123 (Kptlt. Karl-Heinz Moehle), on her third patrol, torpedoes and sinks 6573 ton British freighter Alnmoor about 750 km south west of Rockall in the North Atlantic shipping lanes. Everyone on board perishes, either 45 or 55 men. The Luftwaffe bombs and damages 983 ton British freighter Stock Force in the Humber. A sequence of odd collisions takes place in roughly the same place which results in the loss of three ships. British 286 ton freighter Marguerite, in a convoy, collides with freighter Robert off Flamborough Head, Yorkshire. The Marguerite sinks and there are two deaths, with the Robert picking up the survivors. British 958 ton collier Woodstock then is involved in a sequence of incidents in Robin Hood's Bay which result in a lot of damage. It collides with British 1509 ton freighter Paris, causing the Paris to sink (it is beached but written off). It then collides with French freighter André Thomé, and the Woodstock sinks quickly from a huge tear below the waterline. It is unclear exactly what went on in this sequence of incidents, three collisions in such a short period of time and involving the same ships is pretty unusual. Portuguese tug Furão sinks at the mouth of the Sado River. Seven crewmen perish. Royal Navy submarine HMS Cachalot lays 50 mines off Norway in minefield FD 30. Convoy OG 53 departs from Liverpool. Royal Navy corvettes HMS Laforey are launched and Fritillary and Genista are laid down. U-78 (Kapitänleutnant Adolf Dumrese) is commissioned, U-256, U-660 and U-765 are laid down. 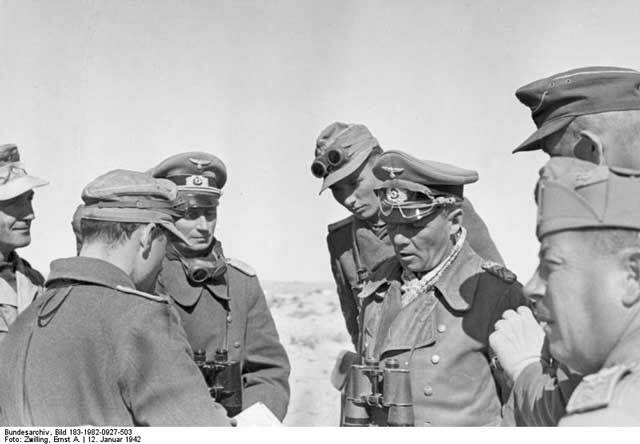 Battle of the Mediterranean: In one of those "firsts," there is the first skirmish between British XIII Corps at Sirte, where General Rommel has sent advance troops. The RAF bombs Lindos Harbor, Rhodes. US/Anglo Relations: President Roosevelt sends a mission headed by Harvard University President James Bryant Conant to Great Britain to facilitate the sharing of technology. Also included in the mission are Frederick L. Hovde from Purdue University and Carroll L. Wilson from MIT. This follows on the Tizard Mission from Great Britain that brought the United States cutting edge technology. One of Roosevelt's biggest successes during the war is his focus on advanced technology, though he chooses different areas to concentrate on than the Axis does. Many drifting straws seem to indicate Japanese intention to make war on us or do something that would force us to make war on them in the next few weeks or months. But the attack which I fear the most would be by raiders, including possibly battle-cruisers, upon our trade routes and communications across the Pacific and Indian Oceans. Some believe that Japan in her present mood would not hesitate to court or attempt to wage war both against Great Britain and the United States. Personally I think the odds are definitely against that, but no one can tell. He asks Roosevelt to impress upon the Japanese that any war against Great Britain would involve the United States as well - something that Roosevelt already has broadly hinted to Japanese Ambassador Nomura. 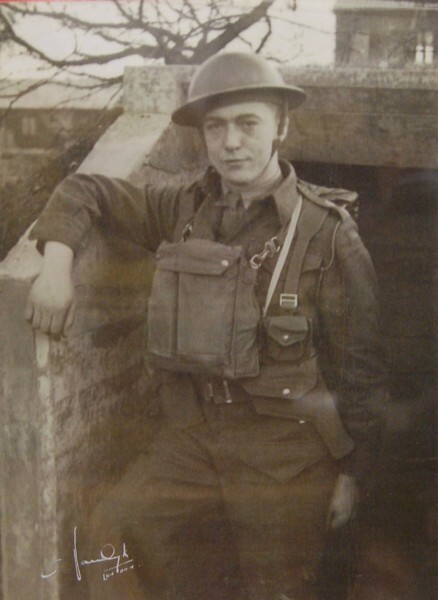 Canadian Lieutenant Roland Gravel of the Les Fusiliers Mont-Royal, Farmborough, England, 15 February 1941. US/Italian Relations: Responding to Italian demands, presumably based on safety concerns following the Royal Navy attack on Genoa, the US closes its consulates in Naples and Palermo. US Military: Chief of naval operations Admiral Stark writes a letter to Admiral Kimmel, CINCPAC. Stark states in the letter that torpedo nets are unnecessary at Pearl Harbor because the depth of the harbor is only 75 feet, which Stark believes is insufficient for air-launched torpedoes (90 feet being the assumed minimum). The Japanese are aware of this issue and are working to find a way around this limitation. Omar Bradley is promoted from lieutenant colonel to brigadier general, bypassing the rank of colonel, and sent to command Fort Benning. Bradley has been Assistant Secretary, General Staff since July 1939. The US Marine Corps 1st Defense Battalion embarks from San Diego, California on USS Enterprise to take up positions on Johnston Island and Palmyra Atoll. They will first stop at Pearl Harbor. Naval Air Station (NAS) Kaneohe Bay is established on Oahu. Its commander is Harold M. Martin. Camp Barkeley, Texas is activated. It is an infantry training post in Taylor County Texas. 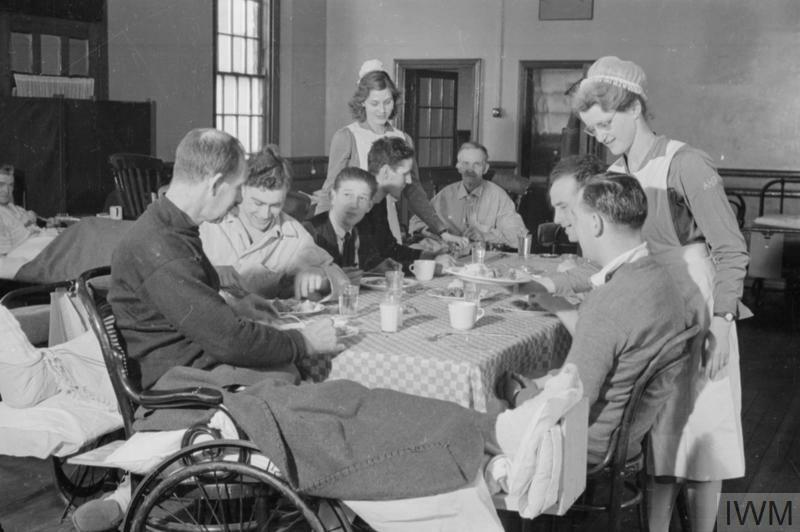 Construction began on 17 December 1940, and it will be declared surplus on 21 March 1945. Congress authorizes construction of a US Marine Corps base at New River, North Carolina. Japanese Government: There is at least one spy in the Japanese consulate in Honolulu. The Japanese vice-consul in Honolulu, Otohiro Okuda, sends a message to Tokyo warning that the US is planning to declare war on Japan by the end of the first week of March. Where he gets this erroneous information, or rather what the original source was, is unclear. 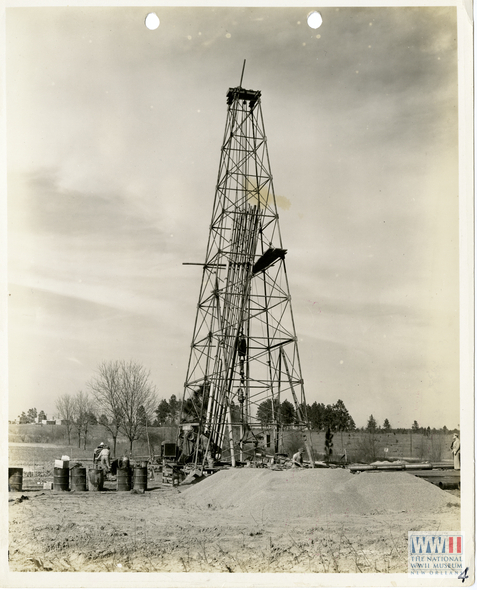 Rigging on water well number 5 at Camp Polk, Louisiana on 15 February 1941 (National WWII Museum). Australian Government: Prime Minister Robert Menzies is in Khartoum, and records in his diary that he visits a memorial today to the 21st Lancers during a past border war. Among the names inscribed on it is that of Winston Churchill. Holocaust: The German government in Austria (Arthur Seyss-Inquart) begins deporting Austrian Jews to Polish ghettos. The first 1000 Jews are sent to a ghetto in Opole, Poland. Spanish Homefront: There is a large fire in the city of Santander. There are 115 deaths. Dutch Homefront: Tensions remain high. Nazi sympathizers (the WA and German Grüne Polizei) and opponents continue to engage in scuffles throughout the city. The enclosure of the Jewish Ghetto has been a prime factor in stirring up demonstrations. American Homefront: Duke Ellington and his orchestra record "Take the 'A' Train" at RCA Victor's studio in Hollywood Studio. The tune is written by Billy Strayhorn. This is only the first of several commercial recordings, but the most famous and enduring. The song has been under development since 1939, when Ellington wrote down travel instructions for Strayhorn to his house which included the directive "Take the A Train." Warner Bros. releases "The Haunted Mouse," a Looney Tunes production by Tex Avery (animation by Sid Sutherland). It features the voices of Mel Blanc as the Black Cat (if you have a mouse, you need a cat!) and Walter Tetley as the Haunted Mouse. This is the first writing credit for Michael "Mike" Maltese, who some consider the greatest cartoon writer of all time for his plays on words and original stories. 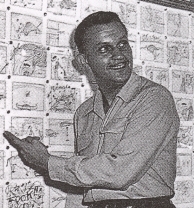 It is Avery's first black and white cartoon in four years as Warners spreads out the work to different directors - Tex leaves the story shortly after.